Leather Texture Wallpaper is an excellent quality digitally created wallpaper in high resolution of brown leather. 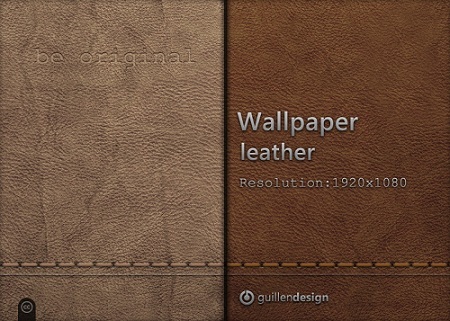 Leather Texture Wallpaper is submitted by GuillenDesign. 1920 x 1080 pixels ; resize as needed. It is a ZIP download, 5.8 MB in size. This Article Has Been Shared 8999 Times! White Rabbit Wallpaper is an excellent quality photo wallpaper of a beautiful White Rabbit with a red ball. Chromatic Smoke Wallpaper is an excellent quality digitally rendered colorful wallpaper. Cite this article as: Abhishek Ghosh, "Leather Texture Wallpaper of high resolution for Windows PC & Mac OS X," in The Customize Windows, July 24, 2011, April 18, 2019, https://thecustomizewindows.com/2011/07/leather-texture-wallpaper-of-high-resolution-for-windows-pc-mac-os-x/.